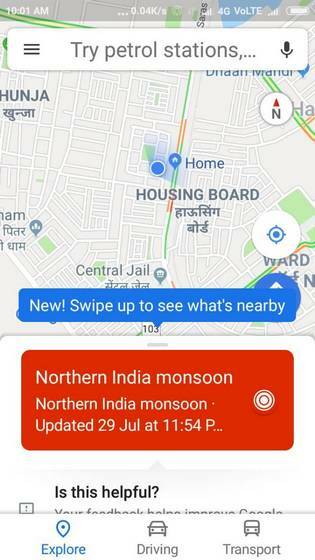 With the monsoon wreaking havoc in North India after a stiflingly hot and sultry summer, Google Maps has introduced a new feature to help users stay on top of all the monsoon-related news in the region. As can be seen below, the server-side feature is alerting all users in the area about the prevailing conditions with a bright red box. Tapping on the box is probably meant to display detailed info about the progress of monsoon in the region, but that feature doesn’t seem to be working on any of the devices we checked as of Monday afternoon (screenshot below on the left). 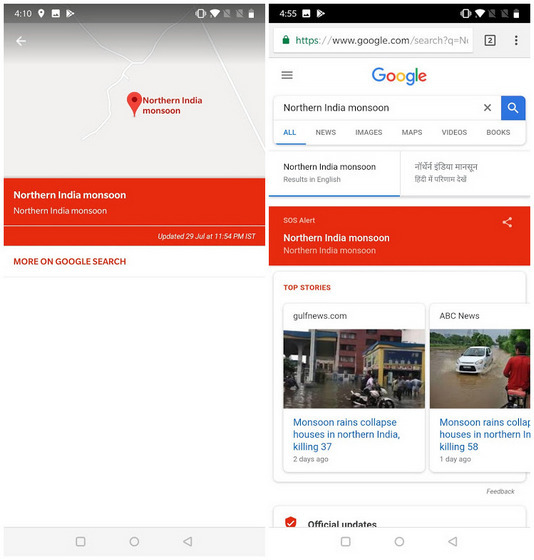 Meanwhile, below the red box, there’s a ‘More on Google Search’ option that takes users to a Google search page for ‘Northern India Monsoon’, which comes with all the latest news about the weather in the region, as seen below (on the right). Like most of the other Google apps, Maps was also updated last month with a number of new features, including a revamped Explore tab and an all-new For You tab. While the former now shows users quick recommendations for restaurants, bars, and cafes in their locality, the latter keeps users updated with info about everything that’s happening in the areas they frequent. Google Maps last week also rolled out the ‘two-wheeler mode’ to a number of East Asian countries after being launched as an India-exclusive feature earlier in the year. The countries that have received the feature already, include Hong Kong, Indonesia, Malaysia, Myanmar, the Philippines, Singapore, Taiwan, Thailand, and Vietnam.